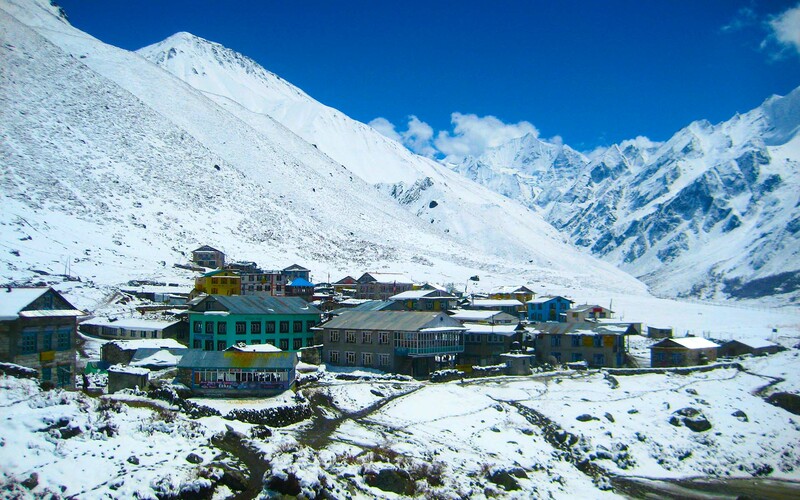 Langtang Region lies north of Kathmandu Valley has hidden beauty of the Himalayas and the rich local culture. 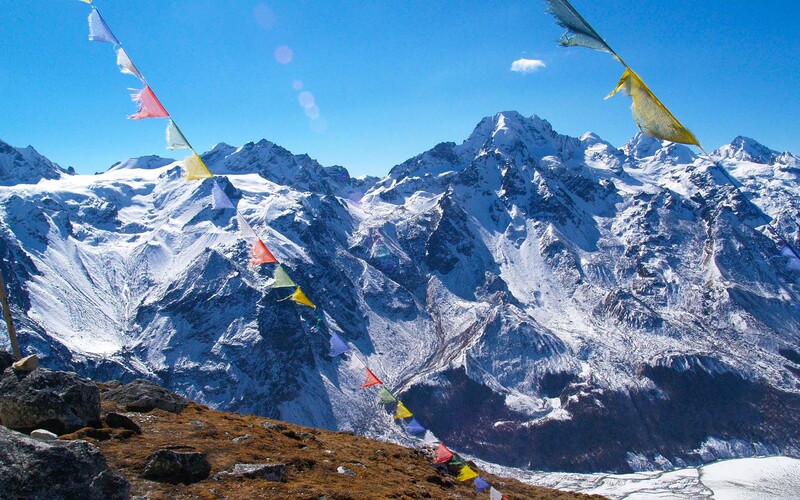 Langtang region is also famous for its Gosaikunda Lakes. 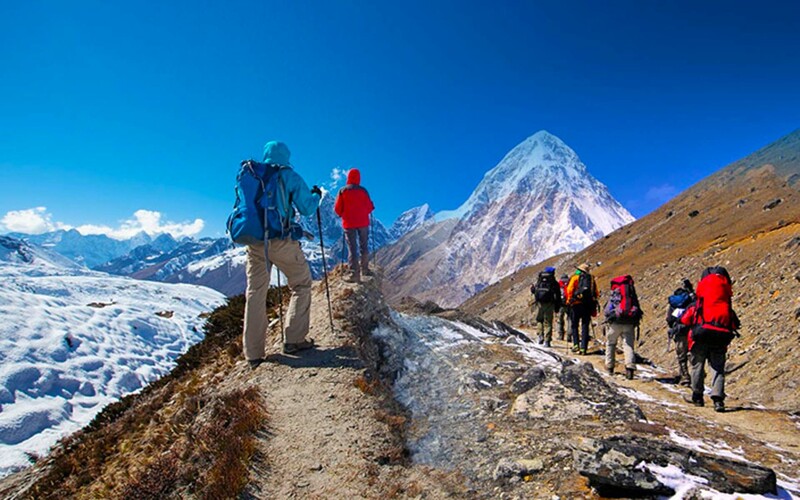 Moreover, the company of green rhododendron and bamboo forests, majestic waterfalls, and snow-capped Himalayas make the trek one of most diverse treks near Kathmandu. The people living the highlands of the Langtang region are certainly the Nepalis, being the descendant of the Tibetan origin, they still look like Tibetans. The trek over Ganja La pass is one of the difficult trek in this region and needs good physical conditions as it passes through places where there are no human settlements due to hard weather conditions. Day 13 Sermathang to Malemchi Puul Bazaar, Drive to Kathmandu. Pickups and drops from airport(s) and hotel(s). Three star hotel in Kathmandu and teahouses during the trek on a twin-shared basis. Cultural Tour in Kathmandu in comfortable private vechiel with the service of english speaking Tour Guide. Pickup and drop, Kathmandu-Syabrubesi-Malemchi- Kathmandu by local bus. Trek Accommodation in best avilable Tea House Lodges/Guest Houses with Three meals (breakfast, lunch and dinner). Service of Local Trekking Leader/Guide & Porters. All necessary paperwork , heritage sites entry fee, trekking permits, government and local taxes. Extra night accommodation in Kathmandu due to early arrival, late departure, early return from mountain (due to any reason) than the scheduled itinerary. Lunch and Dinner in Kathmandu unless mentioned. Tips for Trekking Crews, Tour Guide & Driver. After early breakfast we drive out on a local bus for Syabrubesi along the north-western hills of Kathmandu. Enjoying the country side view and if a day is clear we get to enjoy beautiful views of Mt. Manaslu, Mt. Annapurna and Ganesh Himal. On the way we will have our lunch break at Trisuli Bazaar, a small local town and then continue with the journey to Syabrubesi, the gateway to the trek in the Langtang Region. Overnight in Syabrubesi. The first day of trek route follows the bank of the Langtang River. The trail then makes a steep climb through the rhododendron and pine forests for nearly 2 hours. After crossing fields and pastures to a little settlement, we see a few houses. After this point, we'll cross the river on a wooden bridge just before the valley narrows and becomes steeper. The trail follows the north side of the river making a steep climb towards the ridge top. After the initial climb, the trail levels off as it passes through a village. From here, we'll be climbing through a forest of firs and rhododendrons for about 1 hour to a small clearing. Further on, the trail continues to climb up the ridge side and comes to a trail junction. From here, we will be mostly climbing uphill to Langtang. The route crosses the north bank of Langtang, and we will notice that the vegetation is more sparse and it consists mostly of scrub oaks. We then head to Changtang, popularly known as the Lama Hotel. 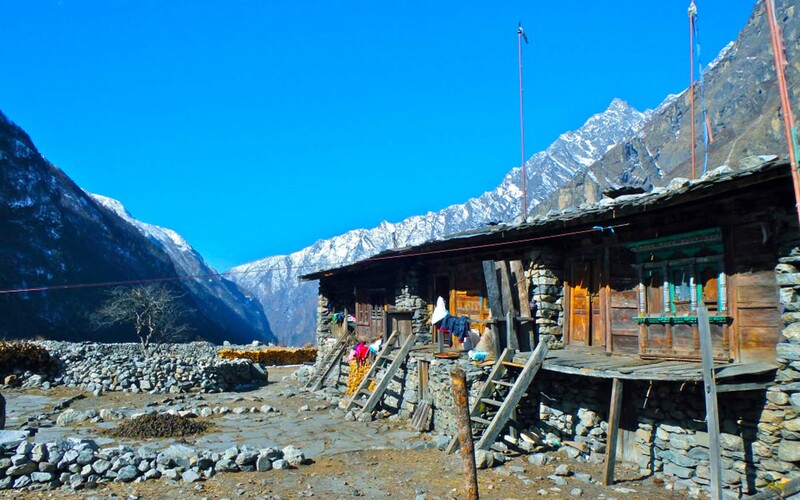 We continue our trek towards the village of Mundu passing through the Langtang village (3,430m) which was badly affected by Earthquake of 2015 but now lots of tea houses are already rebuilt. Our trail pass through dense forests and we get to enjoy beautiful view of the Langtang Lirung (7,246 meters). After breakfast, we will start our journey to Kyangjin Gompa, a major monastery of the area. We will pass by water mills, prayer wheels, chortens, with sacred mounds of rocks with inscriptions carved on them. Also pass the largest mani wall in Nepal, made from stone with prayers written on them. The prayers written on the mani wall is supposed to be blown away by the wind. Today we walk for only 3 hours so that we can spend the rest of the afternoon exploring the buddhist shrine and surrounding areas with the amazing views of the mountains. After early breakfast, we carry on with our trek passing on through yak pastures and continue to Tserko Ri for mesmerizing sunrise views and little exploration. We will get back to Kyangjin Gompa by noon for lunch and rest of the day we just relax and enjoy the ambience. Today we trek to Ganja La Phedi crossing the Langtang River and rhododendron forests. We are in high altitude, into the thin air, so it is good to walk slow and drink lots of water. Walking time might also depend upon the season. Since, there are no any village settlement around the area, so we will have to camp for next three days. The day is comparatively strenuous as we have to cross one of the most difficult passes. Ganja la pass is covered with snow almost throughout the year. Make the long ascent through the boulders, pass the small lakes, and summit the Ganja La which situated on a rocky moraine. Enjoy the spectacular views from the pass. Climbing up and down the pass can sometimes be tricky due to snowfall and ice. From the pass, we descend down to Keldang 4250m/13,940ft. Overnight in Tented Camp. After a tough trek and climb of previous day, Today from Keldang, we descend further down a moderate walk following a prominent ridge line with few ups and downs reaching a small Sheppard’s settlement at Dukpu. In our 5-6 hrs trek today, we continue losing our altitude through forests, ridges, and grasslands.We camp at the summer grazing pasture of Helambu area. Today our trail will lead us to Tarke-Gyang village with downhill at first and then climb a small pass of 4,100 m /13,451 ft high, with views of Ganesh, Langtang and Jugal Himal range. After a pass we gradually follow the path descending into forest of pine, rhododendron trees, today we lose altitude considereably, about 1500 meters. Our walk leads through a flat area with unspoiled forests enjoying the view of beautiful Helambu villages. The trail makes a sweep around the wide valley end between Parachin and the pretty Sharpa village of Gangyul. The people of this village practice Drukpa Kagyu Buddhism, the same as the national religion of Bhutan. The walk continues passing chortens a prayer buddhist monuments, following the trail with superb views of rolling green hills reaching at Shermathang village, a nice village of Yolmos ethnic tribes. Day 13Sermathang to Malemchi Puul Bazaar, Drive to Kathmandu. From Sermathang descend to warmer areas to Malemchi Pul Bazaar with many Sherpa village. From the Bazaar, We take an interesting drive to Kathmandu passing through Dhulikhel and Banepa Town. Drive continues a good road to Kathmandu. After reaching Kathmandu, we can take a rest or venture around the city close to your hotel. Overnight in Kathmandu. This is an extra day in case of delays in the itinerary due to bad weather, landslide etc. The day is free for independent activities or do some souvenir shopping or can explore any other areas of Kathmandu. Let us know and we can arrange for that. 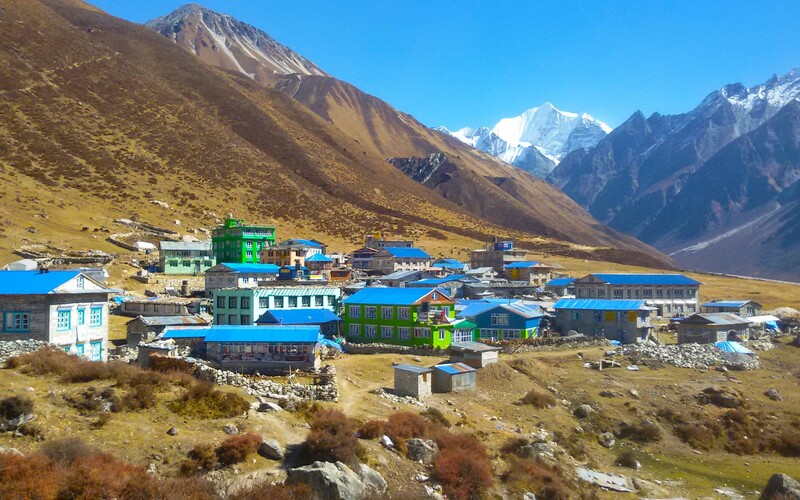 Trekking, High Pass, Great Mountain Views, Local Culture & Delicious Local Cuisine. 3 Star hotels in Kathmandu. Local Tea house Lodges & Tented Camp during the trek.